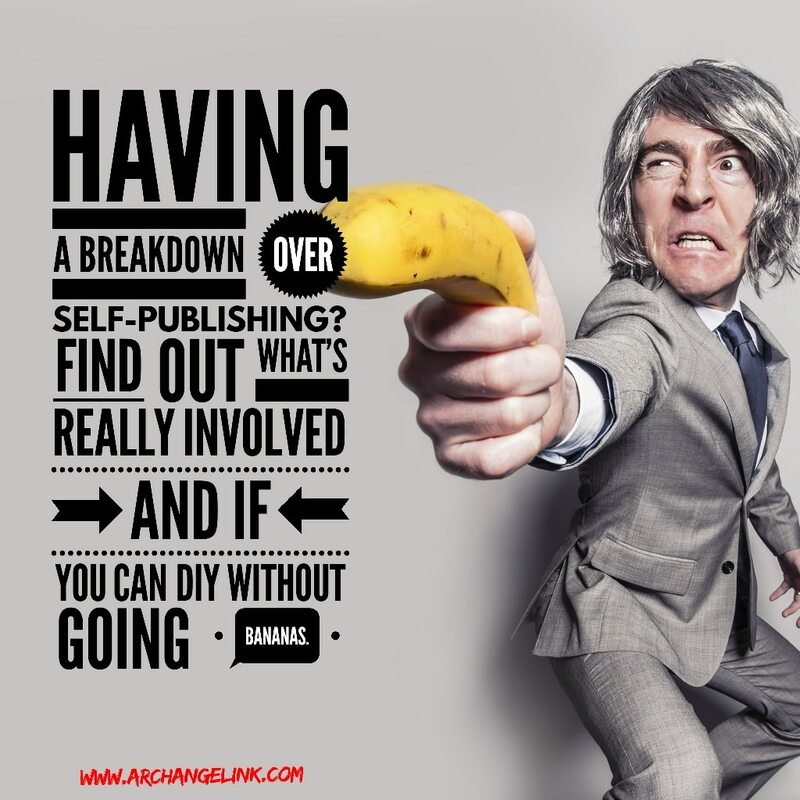 Self-Publishing for Entrepreneurs: DIY or Done-For You? Self-publishing in today’s fast changing and competitive marketplace is becoming increasingly difficult. From dealing with Amazon’s recent changes, to mastering editing, formatting, planning your book launch and on-going marketing, you have your work cut out for you. There are hundreds of things you could do for your book. Just look at the many publishing options out there and see for yourself. Even just a quick Google search can complicate matters and cause you to feel overwhelmed. Do I choose KDP Unlimited? When should I upload my book for maximized visibility? What is involved with setting up my book’s page for best conversions? As a first-time author, I felt overwhelmed by the publishing process, spent way more time than necessary on unnecessary worries and made a lot of mistakes. I didn’t time things right, and my book sales suffered. Lesson learned. That’s why we at Archangel Ink want to share with you some tips on how to self-publish a book. We want to show you how to go from ground zero all the way to your published book. Our publishing packages help get you from A-Z without all the stress, but it is possible to do it all yourself with minimal cost. That said, consider the value of your time when calculating costs. DIY doesn’t equal free (unless you think your time has no value). Our team has years of experience in writing, editing, formatting, and marketing hundreds of books. We have learned from our failures and relished in our successes and aim to pass that wisdom and insight on to you. Without further ado, here is how to self-publish a book in 2018. Self-Publishing 101: Do I self-publish on my own or get help with the details, so I can focus on other things? As I stated earlier, you can choose to self-publish your book all on your own, or you can go with a self-publishing services provider for help. How do you wade through the muck of different publishing options and companies? There are scores of companies out there offering a variety of services ranging from showing you how to self-publish a book through an e-course and other predesigned resources, to individually coaching you along in the process, to doing it all for you so you can focus on what you do best. Here at Archangel Ink we have several package options for your self-publishing needs, but our top priority is not only your success now, but your continued success as you invest in your career. This should be the aim of each provider, though some are just out to make a quick buck off you, and may not give the time and attention to detail needed for long-term success. If you’re a first-time author, entrepreneur or business professional with no experience in self-publishing, we recommend enlisting a trusted expert to help make the process much smoother. Why? For one, it’s quite time consuming to edit, format, proofread and publish a book, plus plan your launch, gather solid reviews and create a cover that will look professional and draw attention from readers. You will likely miss things, deadlines will come and go, and you will be left scratching your head wondering why your book formatting looks wonky when you upload it on launch day. Yikes! You could be focusing instead on what you’re already great at while a seasoned vet (like Archangel Ink, wink wink) manages all these chaotic details. Ahhh… sounds much better, doesn’t it? Whether or not you choose to get help, don’t let the former happen to you. Here are the pieces you will need to fit together. Once you’ve published a book, you’ve entered a chess match. You must fit these high-level pieces into the right places, at just the right time, to maximize your success. Writing and Book Setup: Yes, writing a quality book is *very* important. It’s the most important task of a good book marketer. The better the book content is before the editing process, the less costly and painful it will be to turn your manuscript into a work of art. Feel free to write your book directly into our pre-formatted template, available to download at: www.archangelink.com/skeleton. This file will not only make it easy to organize your book, but can make formatting much easier too if you are taking the DIY route. DIY: This post from Jerry Jenkins is a fantastic overview of How to Write a Book including how to start and how to overcome writer’s block. Done-for-You: Ghostwriting services through Archangel Ink or a worthy freelance candidate. Keep in mind that ghostwriting is time intensive and a good one will be costly. Carefully vet whomever you decide to go with to save yourself frustration later on. We’ve had numerous clients come to us after a nightmare ghostwriting experience, and don’t want that for you, so be selective here. Editing & Proofing: Don’t get stuck with a poorly edited book. We have repeatedly had authors come in with manuscripts edited by an “editor friend.” Then we have the displeasure of telling them that the editing work is subpar and the manuscript needs more work to be publish-ready. The gap between professional and hobby editing is wide. It can mean the difference in good and poor ratings on Amazon and continued readership. You can refer to our editing guide here for more details on the editing process. DIY: Software like Grammarly or ProWritingAid can help to polish your writing and get it in good shape. If you have a professional editing background you can do it yourself, but at least let the manuscript breathe for a week before you begin the editing process. Done-for-you: Find a professional editor you trust. It’s not worth it to go cheap here, you will suffer the consequences later. Here’s an article on what you might expect to pay for quality editing. Pro Tip: English teachers aren’t certified editors. Initial Launch Planning: Set and work towards a launch date from the beginning. Give yourself a target launch date, and work towards that. Once you finish writing, set the launch for 3-4 months ahead to allow plenty of time to get things ready. If it is your first launch, and you are confused at the timing of when to do certain tasks, you can grab my free book with a step-by-step process here, and it will walk you through. DIY: There many resources on Amazon for setting up the initial launch process, such as Tim Grahl’s book Your First 1000 Copies. Alternatively, you can grab both Rob and Jordan’s books on book launch and publishing for professionals in our Entrepreneur’s Starter Pack here. Done-for-you: Be wary of expensive programs or services that guarantee results. Even with the best coaching your book might flop. No one can predict with 100% certainty whether a book will sell well on Amazon. If they could, they wouldn’t be offering their services to you, they’d be keeping their secrets to themselves and quietly making money hand over fist. Find a service provider (like us) that has your best interests at heart and will work with you to reach success by building a foundation and giving you the tools to continue promoting, even after the launch is over. Formatting: I used to think formatting was a piece of cake… until I uploaded my first book on KDP and everything inside was a mess. I didn’t have access to the above skeleton file, and I didn’t know what the heck I was doing. Formatting can be done with Microsoft Word, but many professionals use InDesign. This element is important because if your book doesn’t look professional or isn’t legible, you’ll likely receive negative reviews, and readers won’t take you seriously. Done-for-you: Find someone who knows the self-publishing industry and Amazon standards. You’ll want your book in print format (paperback and/or hardcover), but also PDF Digital copies that you can give away to advance reviewers. MOBI and EPUB versions are needed for KDP and other e-book platforms. Quality formatters ought to give you these formats, but verify to make sure. Book Cover Design: Of all the moving parts in the self-publishing process, I would least recommend going for the DIY version of this one. Unless you are a Master of Design, get help with your book cover. People really DO judge a book by its cover, so make it a good one! If you are up to this level of design work, then by all means go for it. If not, get help. Your book cover is the top level of marketing for your book. More so than your title and book description, your cover is your first chance for your book to make a good impression on people. DIY: Only take on with much confidence, but you can do good design work on a free program called Canva. Canva is ridiculously intuitive and easy to use. Done-for-you: Websites like 99Designs will get you a nice-looking design, and you’ll get to be a part of the design process. Choosing your book cover can be fun and enjoyable and it can beat the suspense of waiting for a design you might not like. However, it’s important to consider the benefits of working with a cover designer that also has an eye for what what’s marketable in your chosen venue. Just because the book cover looks great, doesn’t mean it will sell. Sales Copywriting: Sales copy (your book description, call to action, press release, product page copy) is the pathway to book sales. You have someone that clicked onto your book’s page. They liked your title and/or book cover, and now they need to be convinced to buy. This is your chance to convince them they need to read your book. Some authors are too close to their own work to write this, but others do it themselves. DIY: Step 1: Identify a problem. Step 2: Be THE solution. Guide the reader along and explain to them how your book alone (and no one else’s) will solve their problems. SEO Keywords & Proper Category Selection: This is part of the marketing process, but you want to focus on it early. You can use tools like KDP Rocket to find keywords and the best categories for your book. DIY: I did a write up here about the benefits of using KDP Rocket to find good keywords and categories for your book. You can also learn to use Amazon itself to find good keywords and categories, but it takes longer. Done-for-you: There are people out there that are nerds and love keywords (*raises hand) This is part of our launch package, but regardless of who you go with, be sure to inquire about how they find their keywords. They should do more than picking generic keywords for your genre. They need to know the importance of keywords to your books success, and good ones can be found for every book with a bit of digging. Book Launch and Book Marketing: Every author’s favorite topic of discussion (not). There are many facets to planning a good book launch. The most important thing you can do for your book is to spend ample amount of time mastering the above items to ensure your book is set up properly. After that, formulate a plan of attack for your book launch. A free resource I offer is this board on Trello. I update it often with new items and ideas to suit the market. I encourage you to check it out. If you like it, email me at Jordan@archangelink.com and let me know your thoughts. DIY: Book marketing is best done yourself. Saying that, it does take a lot of different skills to do it well. If you need help, get it, but use what you learn along the way to grow and figure out how to do things yourself. The more you can take on yourself as a book marketer the better. The best way to learn? Read books in the self-publishing genre, be an active member in Facebook groups like Authority Self-Publishing, and act. Try your best but know you will fail along the way. Pick yourself up and keep moving forward with renewed energy. Done-for-you: You can find coaches to help you. (Like me, hey I wrote this post so I don’t feel guilty recommending myself). You can also find people on Upwork or in Facebook groups that can help with specific parts of the process. If you are a master of writing, but don’t understand the marketing side of things, then get help where needed. Most authors hate the marketing part of things, and just wish they could write. This can be you, but recognize that done-for-you marketing services are not cheap. A good coach will invest a lot of time and energy into guiding you in each step, and that’s how it should be. With all the above items in hand (or in a zipped folder), you are ready to self-publish your book. *If the above items seem overwhelming, don’t worry, we’ve got you covered. Browse our packages and set up a free consultation; we’re glad to help. Even if it all we do is talk for 30 minutes, answer some questions you have, and then part ways, we are happy to assist you on your self-publishing journey. We enjoy speaking with high energy, passionate authors and entrepreneurs, no matter their level of experience. If you prefer to read instructions rather than watch the tutorials, see step-by-step instructions below. We recommend uploading to CS at least 10 days before launch, more if you’d like to order and review a physical proof copy first.- You will create your account / log in here and follow the instructions below. You can order a proof copy, additional copies for yourself, events, family, etc. BISAC categories are important for helping people find your book online. You will want to scope through them and pick something that somewhat relates to the main subject of your book. You can add up to 5 keywords and these should reflect what you feel to be important in helping people to find your book. For example: health and fitness, safe and effective weight loss, calorie counting, easy diet plans, healthy weight loss etc. Here’s info on KDP Select, Kindle Matchbook and the Kindle Lending Program. They will ask if you want to sign up for these when you build your listing on KDP. 3-5 days before your official launch – Create your KDP account if not already established, then build your listing and publish on Amazon. This allows time for processing and correcting any errors etc. before your official launch day. Once logged in and profile is complete, at the top is a link that says “View and Edit Your list of Books”- click that. There may be one more confirmation page, but it should be straightforward. If you run into any trouble along the way, the best thing to do is contact KDP customer support and make them aware of your issue. They are very responsive and helpful in solving issues that come up. The most important questions to ask are, what do you need help with, and what are you willing and able to do yourself? Smart entrepreneurs and authors know that there are limits to solopreneurship, and at some point if they want to scale up, they will need to build a quality team around them that they can trust. You can work towards only doing the parts of the self-publishing process you like and pass the rest on to quality individuals around you. Finding a good mix of help + learning to do it yourself is essential to long term success whether you decide to DIY or get it done-for-you. Good luck as you journey into the self-publishing world. It can be challenging, but with persistence and deliberate action, the victories will come. We wish you much success!